This book examines the problems of boundary demarcation and its impact on territorial disputes, and offers techniques to manage and resolve the resulting conflicts. Historically, most civil conflicts and internal wars have been directly related to boundary or territorial disputes. Cross-border discord directly affects the sustenance and welfare of local populations, often resulting in disease, impoverishment, and environmental damage as well as creating refugees. Although the impact of territorial disputes is great, they can often be settled through bilateral, and sometimes multilateral, agreements or international arbitration. This book sets out to probe into the problems of existing techniques on boundary demarcation and to test their possible impacts on boundary and territorial disputes. Various factors and their influences on cross-border tensions are tested, either qualitatively or quantitatively. After close examination of dozens of the most significant cases, the book presents various alternative solutions to the achievement of cross-border cooperation in disputed territories. An `art of avoiding war' is included within the book, comprising six key schemes and five negotiating techniques. The comparative advantages, costs and benefits of each of these is analyzed and evaluated. 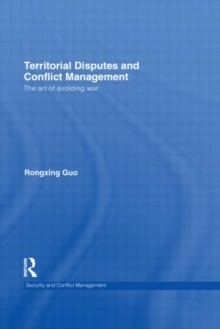 This book will help guide practitioners in territorial disputes and will be of interest to students of conflict management, international security, peace and conflict studies, political violence and IR in general.